Folding Scooter Ramp, manufactured from glass reinforced plastic and with an effective slip resistant coating. The folding scooter ramp is designed for use with manual wheelchairs, powered wheelchairs, and three or four wheel mobility scooters. Made of reinforced fibreglass, this mobility scooter ramp is strong enough to withstand weights of up to 250kg (40 stone) while the effective non slip coating offers a safe surface whatever the conditions. This scooter ramp folds in half and is locked in place by user friendly fasteners for ease of storage. 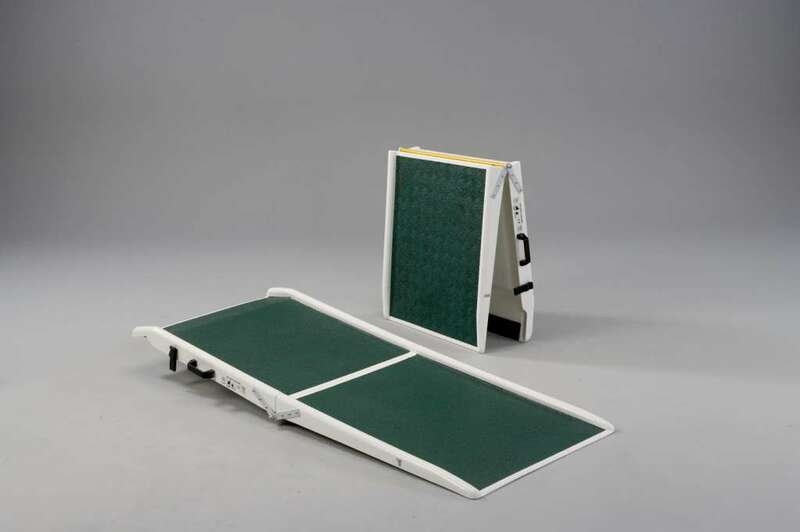 With a handy, comfortable carry handle, this ramp carries like a briefcase for ease of handling. Available in 3 different lengths: 4ft (108cm), 5ft (152cm) and 6ft (182cm). Please note there is also a 6ft length with internal track width of 725mm (28½") also available. We found this ramp nice and lightweight, it folds easily when not in use and has a good non-slip covering, very happy with our purchase.